(Irving, TX) – Now that summer is officially here, AAA Texas reminds drivers about the dangers of leaving children and pets in vehicles during the summer heat. Temperatures inside a car, even on a mild and sunny day, can rise 20 degrees in just 10 minutes. Children are particularly susceptible to heatstroke because their bodies can heat up five times faster than adults. Heatstroke deaths have been recorded in 11 months of the year in nearly all 50 states. Animals are equally impacted by summer heat. Dogs are not able to sweat like humans do, but instead cool themselves by panting and by sweating through their paws. If they have only overheated air to breathe, they can collapse, suffer brain damage and die of heatstroke. Prevention is the best way to keep heatstroke at bay. Just remember to ACT. Avoid heat stroke-related injury and death by never leaving your child or pet in a vehicle, even for a minute. Create reminders and habits that give you and caregivers a safety net. Leave an item needed at your next stop in the back seat so you don’t forget about your loved one. Take action if you see an unattended child or pet in a vehicle. Dial 911 and follow the instructions of emergency personnel. 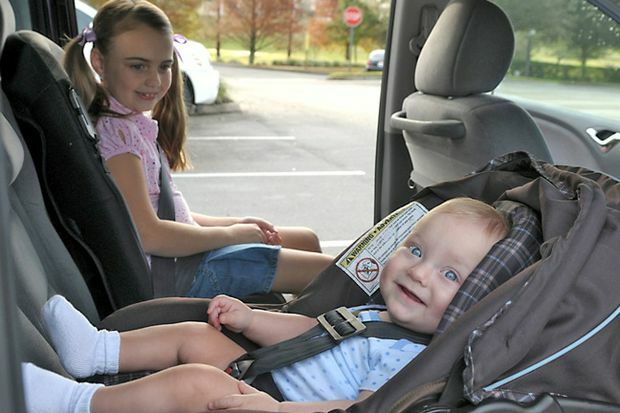 In addition, when traveling with children and pets during the summer, make sure both are safely secured. Motor vehicle crashes are the leading cause of death and injury for all children. Child safety seats, or car seats, reduce the risk of injury by 71% to 82% and reduce the risk of death by 28% in comparison to children in seat belts alone. Booster seats reduce the risk of nonfatal injuries by 45% among 4 to 8 year olds. All vehicle occupants need to be properly restrained by seat belts or child safety seats to prevent injury in case of a sudden stop, swerve or crash. Seat belts and car seats contact the strongest parts of the body, spread crash forces over a wide area, help the body slow down and protect the brain and spinal cord. Before you install your car seat, be sure to read both the car seat instruction manual and your vehicle owner’s manual. Also consider having an expert check the seat. The service is free and only a step away. To find a certified technician, call (866) SEAT-CHECK or visit http://www.seatcheck.org. 3. One that you will use correctly every trip! Pets can be great traveling companions but animals that aren’t contained can be a major distraction to drivers. A recent survey found 65% of dog owners admitted to engaging in a distracting activity while driving such as petting their dog, using hands or arms to keep a dog from climbing from the back seat to the front seat, allowing a dog to sit in their lap while driving, giving food or treats to a dog, or playing with a dog. Beyond distraction, unrestrained pets can become projectiles in a vehicle crash, injuring or killing occupants in the car or truck. If you’re in a collision at just 10 miles per hour, a 40-pound unrestrained dog in the vehicle could hit occupants with a crash force of 400 pounds. AAA Texas recommends drivers use pet restraint systems or pet carriers that limit a pet’s movement and that use vehicle seatbelts to mitigate crash forces. Additional tips for traveling with pets can be found in Traveling With Your Pet: The AAA PetBook.® This complete planning guide for travelers who embrace pets as part of the experience can be found at your nearest AAA Texas branch or at www.aaa.com/petbook. As North America’s largest motoring and leisure travel organization, AAA provides more than 54 million members with travel, insurance, financial and automotive-related services. Since its founding in 1902, the not-for-profit, fully tax-paying AAA has been a leader and advocate for the safety and security of all travelers. AAA Texas can be visited on the Internet at AAA.com.